This winter, I focused on running and building my endurance and speed. Now that it’s April, my goals are shifting to include multisport training. If you’ve been thinking that THIS is the year that you give triathlons a try, then these tips are for you! My goal is to help you move past the beginner triathlon phase quickly, without having to learn through trial & error. 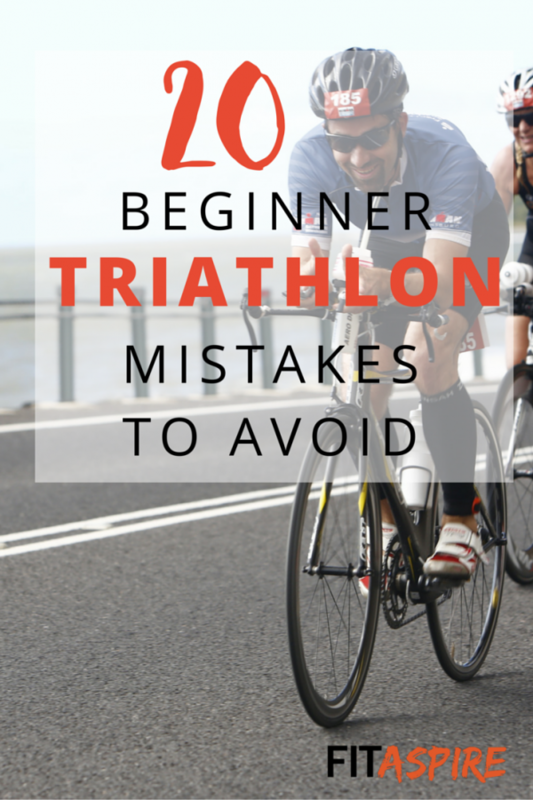 This list was created based on a combination of mistakes I made myself as a beginner triathlete and questions I’ve heard over the years as a triathlon coach. Your first race should be fun, not stressful and disappointing. You’ll have plenty of races in the future to shoot for the starts, but don’t take all the joy out of this new sport by setting unrealistic goals. I encourage all first-time triathletes to finish with a smile on their face, versus a time-focused goal. Stomach issues can lead to a very long, very miserable race day. So don’t try something new on race morning (or the night before). Practice your race nutrition routine during weekend morning training, so you know what works on race day. Triathlon is more than just swim, bike, and run. You also have to shift from swim-to-bike and bike-to-run, so make sure that you practice that transition. Create a mini-transition area in your driveway and practice switching from swim cap & goggles to bike shoes, helmet, and sunglasses. Do the same for bike-to-run transitions until the transition feels easier! No one wants to finish the swim and then wander around transition looking for their bike. No – it wasn’t stolen – you just forgot where it was racked. 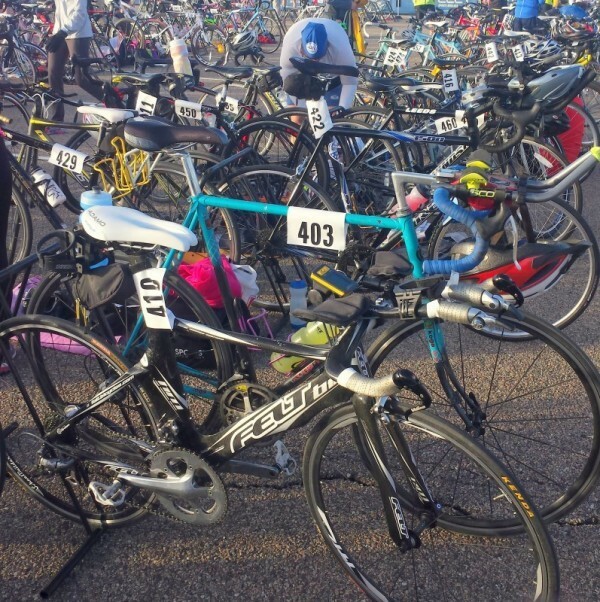 Count the number of racks from the swim entrance to your bike, so you’ll feel relaxed as you run into transition. You must wear your helmet, with the chin strap buckled, at all times while on your bike. That includes before, during, and after the race. Don’t unrack your bike until your helmet is strapped! Drafting on the bike is prohibited – that means keeping at least 3 bike lengths between you and the bike in front of you. At some races this might be 5 bike lengths – so check the rules! No headphones during the swim, bike, or run. On the bike, stay to the right unless you are passing. See all the rules on the USAT website. Tri suits, triathlon bikes, clipless pedals, aero helmets, race wheels…there is a lot of gear you could buy for triathlon. But seriously, save that for later. You don’t need to break the bank to try a triathlon! Wait until you get hooked. And even then, make sure you need it before you buy lots of fancy gear. You’ll often see better results with a smart coaching plan & consistency anyway. >> My recommendations for basic gear to get started. If you rode your bike downhill into transition, you might be in a big gear. If you’ll be starting the race climbing that hill, make sure you shift down to an easy gear before racking the bike. It’s really hard to start going in a big gear on a flat or uphill course. Unless you were a competitive swimmer in the last 5 years, you probably shouldn’t be at the front of the swim. Save yourself a lot of stress and frustration, but lining up with those who plan to swim the same speed as you. Just ask those around you at the start to get an idea of where the right place to line up is. In running, you’ll see people throwing trash throughout the race. That doesn’t cut it in triathlon. Make sure you only discard at aid stations. If you come to triathlon from another sport, you may be anxious to jump straight to getting faster. But remember, you need to build that base of endurance first – the speed will come later. Don’t rush the process and end up injured before you get started! Even the sprint triathlons aren’t really a sprint – remember to pace yourself. It’s very common to see new triathletes go out to fast on the swim, try to hammer the bike, then walk the run. Heck, many more experienced triathletes haven’t learned this lesson. Slow down and pace yourself, so you can finish the race with a strong effort in all three disciplines. Most of us train for races in the pool, but race in a lake or river. That transition can be rough, as visibility is much lower and that can be disorienting. Make sure you plan some time to practice swimming in open water before race day to prevent any unpleasant surprises. I can tell you this one from personal experience! If you’re going to be racing outside, you need to lather up with water & sweatproof sunscreen to protect your skin. You don’t want to end up with a nasty sunburn to remember your first race – or have your race numbers burned into your arm. Lather up before the race. You don’t need to be a bike pro, but some basic maintenance skills will save you from potential frustration. Ask your local bike shop or a cyclist friend to teach you: how to fix a dropped chain & how to fix a flat tire. These are the two most common issues you may encounter and are much easier to learn than you think! In running & cycling, you will get better from simply doing more. But swimming doesn’t work that way. It’s more important for you to start by working on your form from the start. Find adult swim lessons at your local public pool – or good swim lessons in your city. At the very least, ask a friend who is a good swimmer to take you to the pool and teach good form. Strength training is a key component of any well balanced training plan. Not only will it help you build power to swim, bike, and run faster – but it will help you prevent & correct muscular imbalances. Include at least 2 days of strength training in your training schedule. Don’t be that person who uses a beach towel to set up transition. There’s very limited space and there’s no reason you need that much room! Don’t use anything larger than a hand towel to lay out your space for transition. >> See how I lay out my transitions here. I’ve seen people do the entire run with a helmet on for making this mistake! Although it’s a harmless mistake, it’s still one you probably want to avoid. Take your helmet off after racking your bike, so you don’t forget! What are bricks? This is when you do two sports back-to-back, just as you will do during the race. The most important brick workout for most athletes will be the bike-to-run brick. Try adding a 1 mile run after your weekend bike to help teach your body how to run off the bike. And this is the perfect time to practice transitions (see mistake #3)! It’s no fun to get to the race and realize you forgot something important at home. That’s were an awesome checklist can save the day, allowing you to literally check the list for everything you need. >> Get your copy of my triathlon checklist here. Read my Try a Tri series and start planning your first race! 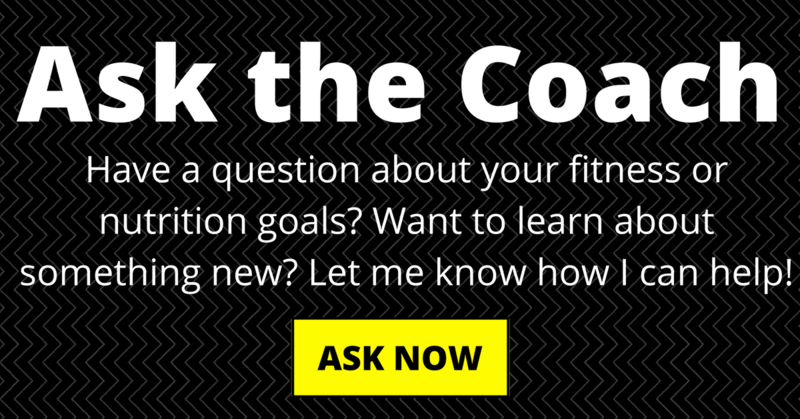 Consider expert coaching to take your training & performance to the next level.